Bring some winter fun inside using corks to create classic winter characters! 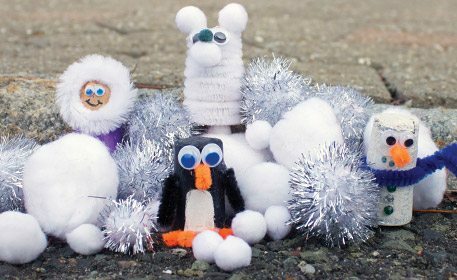 Make a polar bear, a snowman, a penguin and even a little eskimo to keep you company on the really cold days! Paint a wine cork white. Glue (2) 7mm wiggly eyes to the snowman’s face. Wrap half of a blue fuzzy stick around the cork to be his scarf. Twist at the end. Add (3) mini acrylic jewels as his buttons. Cut a 1″ piece of orange fuzzy stick for his carrot nose and add black marker dots for his coal teeth. Paint a champagne cork a skin color. We chose to use the peach from the acrylic paint pack. Paint the bottom half and back and sides of the top purple. Cut a 3 1/2″ piece of a white puffy fuzzy stick and curve into a circle. Glue around the top to be the eskimo’s hood. Glue on (2) 7mm blue wiggly eyes and a smiling mouth. Cover the wine cork in black paint, but leave a white area for the penguin’s belly. Cut a 1″ piece of orange fuzzy stick and fold in half. This will be the penguin’s beak. Glue on (2) 10mm blue wiggly eyes and his beak. Cut (2) more 1″ piece of fuzzy stick and fold in half, but not as tightly as the beak. Cut (2) 2″ pieces of black fuzzy stick and fold in half, the same way as Step 5. Glue the orange fuzzy stick pieces to the bottom of the cork, to be the penguins feet and glue his black fuzzy stick arms on the sides. Wrap a white fuzzy stick around the wine cork, so it is completely covered. Add (2) small white poms on the top of the wine cork to be the polar bear’s ears and a small white pom in the middle to be the bear’s snout. Glue on (2) 10mm wiggly eyes and a black mini pom on top of the white snout for the nose.